This morning we participated in the annual Resolution 5K run. It was an incredible 3 degrees outside…definitely the warmest resolution run we’ve ever done. We normally experience temps closer to -20 degrees celsius so it felt more like spring than winter. Today was also Don’s first official day as a retired old fart. 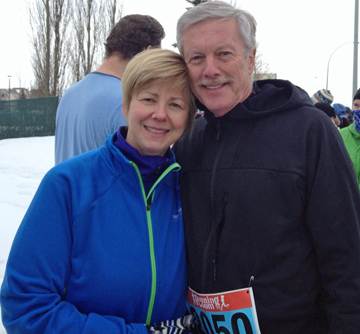 I did the resolution run in Winnipeg this morning. It was a brisk -13 (-25 with the windchill).